The command and control vehicle of Civil Protection service has the role of coordination vehicle in the case of the larger scale events and disaster incidents. 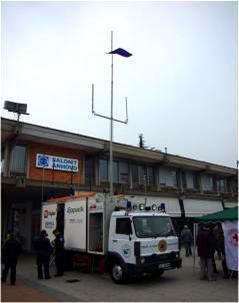 The vehicle is operated by Radio club Soca in order to establish a command and control center that coordinates the teams, which are activated during disastrous events. Project of constructing and building the vehicle was elaborated by a consortium of more companies. Our company was engaged in as a consultant and a designer of ICT infrastructure. The vehicle's is heavily equipped with radio communication devices. Coordination of teams in disastrous events is mostly executed by radio communications. Tall antenna ensures the vehicle the larger area of coverage for radio devices of the teams under control. Radio network s are operated by the NDC-Dicom++ program and the radio controller. Touch screen monitor eases the use of the program by simply touching the screen. Radio controller, NDC-Dicom++, which is integrated in the vehicle, can support up to 16 radio devices. 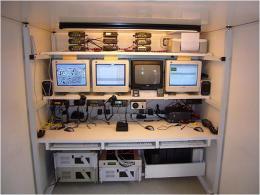 In addition to the NDC-Dicom radio control solution, the vehicle consists of computers to support other processes. There are three workspaces for vehicle equipment operators. All radio conversations are recorded by LRProfessional Voice recording solution. Electronic map shows the locations of the rescue teams equipped with radio devices. Professional analogue mobile radio devices (PAMR) are used. They are able to send the GPS position to the vehicle command center. There is Wi-Fi network around the vehicle. The Wi-Fi network covers command and control terrain tent and supports the users that can use data network to connect to the internet. The vehicle itself and its functionality was presented to the public at ZiR 2007 event on October the 19th, 2007. The vehicle is operated by a association named Radio club Soca. - secured Wi-Fi network in the area of the vehicle and command and control terrain tent .